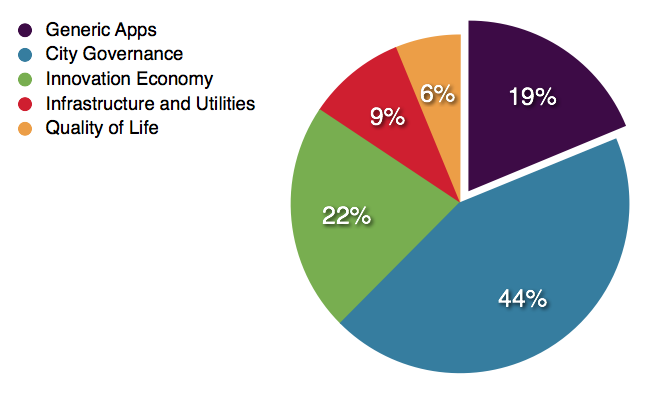 The most common licenses used for the apps are the GPLv2 or v3 license (19 apps) and the AGPLv3 license (5 apps). Some of the rest of the apps are licensed under the MIT, Apache and BSD licenses. There are many examples of apps related to e-governance and open data (OpenGovernment, OpenSpending, CKAN, Open Data Catalog, OpenPublic). Another important area of interest for applications is citizen participation, either in decision-making processes or in distributed data gathering / crowd-sourcing (OpenTreeMap, DistrictBuilder, All Our Ideas, Textizen, FixMyStreet, Improve My City, Shareabouts, OpenBlock, LocalWiki). Some of these applications are of interest to a limited number of organizations. Applications for safety and security, for example, are mainly of interest to the police, and that could make them more appropriate to be developed as proprietary solutions. Applications related to commercial activities are also more likely to be sold as proprietary solutions in the form of complete software packages with included technical support and maintenance. Also, some of the proprietary software already used in businesses can be very hard to change, such as banks’ database systems or factories’ asset management software. Some of the apps on ICOS are in a mature state of development and consequently have relatively extensive feature sets, as well as complete documentations. 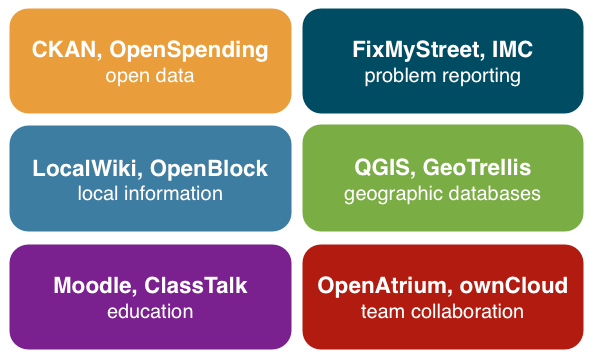 Examples of “mature” apps are Quantum GIS, Moodle, OpenAtrium, LimeSurvey, and Drupal. Conversely, some other apps do not have that level of maturity, either because they were developed for a specific purpose or a specific place (e.g. Water Storage or Look at Cook), or because they do not have a particularly active user base and therefore are limited in terms of documentation (e.g. Open Data Catalog or Zanby). While not prohibitive, these limitations mean that those apps might need more effort in terms of customization or installation on the part of the implementing authority. ICOS stands for Intelligent Cities Open Source, a community of developers, planners, engineers, and users working in the field of intelligent / smart cities. ICOS is a meta-repository of open source applications and solutions. It is addressed to anyone interested in intelligent / smart cities development and looks for applications and solutions which have been successfully implemented in other cities. In the technology supply side, it is addressed to developers wishing to disseminate the applications and solutions they have created. In the demand side, ICOS is addressed to city authorities, infrastructure and utilities managers, city stakeholders, city cluster ,managers, city planners and engineers wishing to use smart city solutions in order to increase the competitiveness, cohesion, and sustainability of the city / district / network. Each application is categorized by the city function that it serves, the type of software, technical characteristics, and license type. More information is given in the Overview, Key-features, and Who-is-using the app. The code can be found in the github or other similar repositories of open source software. Links are given to download the application, visit the official site, find documentation, and the discussion forum. We estimate that a number of 200-300 different applications is needed to cover the main domains of intelligent / smart cities: the economy of cities, city infrastructure and utilities, citizens quality of life, and city governance. The aim of ICOS is to offer this software as open source and free software.